Kevin is a psychologist and psychotherapist in private practice in the U.K. 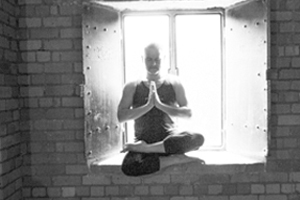 He is also an 800 hour certified Jivamukti teacher having completed his training under the tutelage of Jessica Stickler in New York at the Jivamukti Yoga School in 2016. Kevin has been practising yoga for 17 years and started yoga to find peace and escape from 3 children under 3. Firstly, Ashtanga then quite by accident Jivamukti and Jivamukti really spoke to him and he decided to train to teach. Having been introduced to meditation in 1991 he had a deep understanding of benefits of yoga and meditation and this is borne out in his teaching style. Dynamic witty and challenging kevin takes you on an inward journey to help you discover your truth.